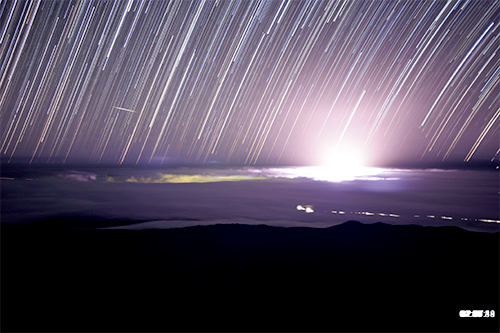 Star trail image showing glow from volcanic eruptions in Hawaii (bright glow right of center). A bright meteor and the greenish glow of the town of Hilo can be seen left of center. Image produced by stacking about 100 images (about one hour) from a time lapse sequence obtained from the Gemini North telescope’s cloud camera on the night of May 21-22. Credit: Gemini Observatory/AURA/NSF star trail image compiled by Joy Pollard.